AutographsForSale.com offers dozens of authentic hand-signed autographs from LPGA women's golfers on golf cards, photos, golf balls, magazines, pin flags and other items. We offer autographs from LPGA stars past and present including Paula Creamer, Shanshan Feng, Sandra Gal, Natalie Gulbis, Nasa Hataoka, Brooke Henderson, Ariya Jutanugarn, Danielle Kang, Lydia Ko, Minjee Lee, Stacy Lewis, Nancy Lopez, Ai Miyazato, Azahara Munoz, Lorena Ochoa, Se Ri Pak, Suzann Pettersen, Beatriz Recari, So Yeon Ryu, Annika Sorenstam, Yani Tseng, Karrie Webb and more. This page also includes celebrity golf autographs. 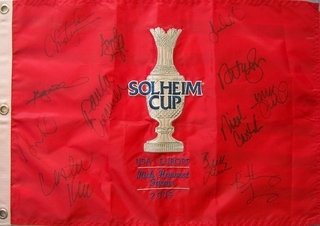 Shown at right is a 2009 Solheim Cup pin flag autographed by the winning United States team.